Old allies need your strength again in the bonus chapter! 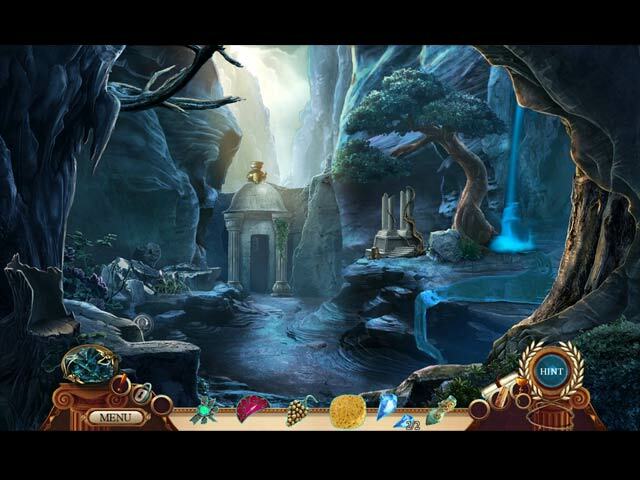 Gain insight into the world of mythology by finding collectibles! Replay HOPs and mini-games, and much more! 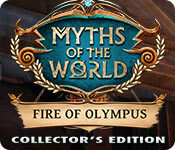 Myths of the World: Fire of Olympus Collector's Edition is rated 3.0 out of 5 by 17. Rated 5 out of 5 by Darklldo from A nice game to play There are several things I liked about this game. First of all, it was in decent colour - daylight - with none of the oh so difficult and boring deep blues and heavy purples. Second, it was a relatively relaxed game to play in the first mode, but could become more difficult if you chose one of the other modes to play in. There was only ONE thing to find in each scene, which was a pleasant relief - one can get so distracted looking for medallions, items and morphing objects in every scene. If you are as sick of the overload we have been getting lately as I am, then this is a pleasant relief. Rated 5 out of 5 by LosAngeHell from The Best Myths of the World Yet When I saw the other reviews, I thought the game would not be fun, however, I played the demo anyway. I was pleasantly surprised at the beauty of this game, both graphically and musically. I love the puzzles and am enjoying every scene. The music is enchanting and peaceful, perfect to relax and appreciate how much creativity from the devs went into making a game that stands out from the rest. Many other games are noisy, copycat and irritating so I would turn down the sound and delete the demo after five minutes, but not this one. A delightful experience full of grace and cleverness. We need more solace in the world, especially now. Too often, we have settled for a world of crassness, stupidity and silliness in games as well as real life. Here, we can see that there are still places of tranquility left to cherish. Thank you, creators.This is a definite buy. Rated 5 out of 5 by pennmom36 from ZEUS' WRATH I love Greek Mythology, and one of my favorite is the story about Prometheus, the Titan god who was tasked with creating mankind. Although there are several versions of this particular myth, the most common version is that Prometheus molded humans from clay and Athena breathed life into them on Earth. Epimetheus was tasked with endowing humans with gifts that would help them survive, and he liberally spread around gifts of wings and even fur. When the gifts were depleted, Prometheus felt sorry for his beloved mortals, and he raided the workshop of Hephaistos and Athena, stealing their fire, which he then gave to the humans. This was considered treason by Zeus, who sentenced Prometheus for all of eternity (fear not, because Hercules just so happens to owe Prometheus a favor!) Prometheus was chained to a rock near a giant Eagle's nest, and she fed upon his liver, but his immortal body would heal each day, and each day, the eagle would return! In this episode of Myths of the World: Fire of Olympus, Zeus rendered Prometheus' daughter Lysandra mortal, as part of his punishment. The former goddess of Eternal Frost, uses a portal to the mortal world, in search of a way to restore her powers, because without immortal powers, she's helpless to defeat Zeus and save her father. Myths of the World has done a fantastic job converting this Greek mythology tale into an entertaining game, even though they have tweaked the storyline a tad bit. They have made the characters likable, the puzzles and HOP's theme related, with graphics that are fairly decent and time period appropriate. Fire of Olympus is one hundred percent better than the last game offered in this series, The Black Sun! The only complaint I have is that as a Collector's Edition, it lacks a wow factor, because it only offers 38 Hidden Omega Symbol Signs, which is more than a little disappointing. I will say that the signs are challenging to find in some of the scenes because they are partially hidden by other objects. 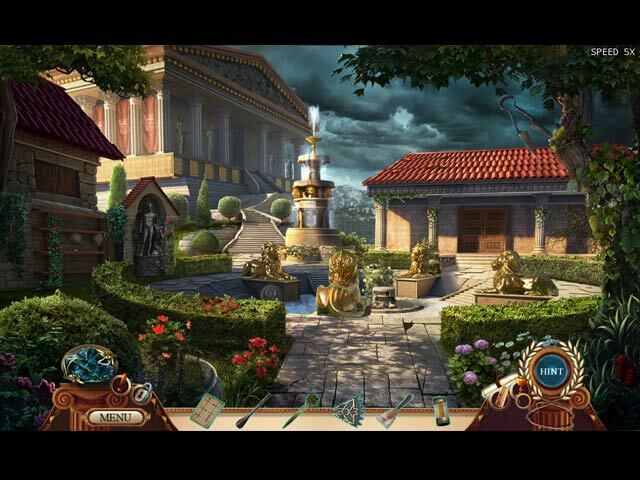 The Hidden Object Scenes are varied with several different types. There are Interactive List finds, Multiple Object finds, Riddle Description finds, Keywords in a Sentence finds, Symbols to find with a pedestal that can be turned, and scenes where you must find 5 identical items of two types to receive a tool to uncover the listed items. There are also smaller Zoom Zone scenes, and an optional Skipping Stones game to play. The Mini Games are pretty good, most of which are of medium difficulty but very doable. Below are brief descriptions of some of the games you'll encounter during the demo: 1) Drag the symbols until all sections align. 2) Place all tokens inside the grid so that the number of tokens match the numbers located on the rows and columns. 3) Grab the correct stones to descent the cliff. 4) Create a path so that all of the blue triangles on the tokens are connected. 5) Move the ball to the hole by rotating paddles and interacting with obstacles. 6) Rotate tiles to restore the picture. 7) Play the proper melody on the Lyre strings using the clues shown. MYTHS OF THE WORLD GAMES AVAILABLE Title****Collector's Edition release date****Average rating -Black Rose (CE 10-25-14) 4.3 -Born of Clay and Fire (CE 3-10-16) 4.1 -Bound By The Stone (CE 12-17-16) 3.0 -Chinese Healer (CE 1-29-13) 4.3 -Fire of Olympus (CE 7-6-17) -Island of Forgotten Evil (CE 8-18-16) 3.4 -Of Friends And Fairies (CE 6-7-14) -Spirit Wolf (CE 1-23-14) 4.2 -Stolen Spring (CE 11-6-13) 3.6 -The Black Sun (CE 3-18-17) 3.2 -The Heart Of Desolation (CE 4-11-15) 4.2 -The Whispering Marsh (CE 9-3-15) This Collectors Edition has 38 Hidden Omega Signs, Skipping Stones games, a Souvenir Room, 7 Videos, 9 Music Soundtracks, 8 Wallpapers, 6 Concept Art pictures, 20 replayable Mini Games, 9 replayable Hidden Object Scenes, a built in Strategy Guide and a Bonus Chapter, enjoy! Rated 5 out of 5 by biscuitsmama from IT MIGHT NOT BE TOO BAD TO BE A MERE MORTAL This latest game in the Myths of the World Fire of Olympus is the tale of Prometheus and his daughter Lysandra. Prometheus has done the unthinkable and stolen fire from the Gods and given it to Humans, a crime punishable by death. Rather than killing Prometheus, Zeus instead decides to make an example of Prometheus by chaining him to a rock at the end of the world where he can watch his daughter struggle as a mortal. Lysandra, banished from Mount Olympus now must struggle against Zeus’ wrath to save her father as well as herself. Graphics are excellent but the voiceovers are not that terrific at times. Gameplay modes – Mortal, Hero, Demigod, and Olympian (Custom) Hints: 10 - 120 Skips: 10 400 seconds Tools include your map as well as what remains of your power now that you are a mere mortal. Since others will provide the details of the HOPS and puzzles, I will only say that I found them to be quite different and creative. As much as I enjoyed the HOPS, I LOVED the puzzles that not only are fun to play but they are different than those we always see from EPIX. By now most of you know what to expect when it comes to Collector’s Editions and the developers rarely depart from what is to be included most CEs. Fire of Olympus does include collectibles but I didn’t find the normal morphing objects that this developer normally includes in its games. There are most of the other expected extras including the strategy guide and bonus game and don’t forget achievements. In the past year I have become quite bored with the Myths of the World series but feeling rather bored, I finally sat myself down to play the beta for Fire of Olympus. What a terrific game! I was thoroughly engrossed as I played and it was quite a surprise when the beta ended. 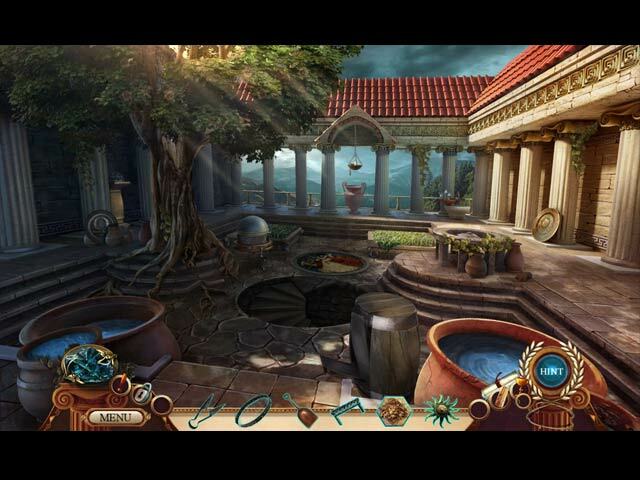 Fire of Olympus has a very good storyline with some wonderful gameplay features. Yes, there still is a certain amount of hand-holding as you make your way through the game but for me the creativity of the HOPS and puzzles are what made the game. Most often when I see a new “tool” that lives on the inventory bar, I almost groan since I know there will be some lame puzzle that I must complete before it is ready to use. However, I was very surprised at how much I enjoyed the puzzle attached to using my “Frost Power”. Not only was the puzzle to charge my power entertaining, it was a bit challenging as well. After playing the beta, there was no question in my mind that I would buy the full game as soon as it was released. This morning my wait is finally over so now I am going to put my feet up and play this excellent new “Myths of the World game to see where my path leads as I battle Zeus, try to survive, and do what I can to save my father. Happy gaming! Rated 4 out of 5 by dancemom1 from You don't mess with the Gods! Hi all! Wow, unless my count is off, this is #12 in this series. I do have all the others, but not all are CE versions. As always, I review on the game play and seldom on the story line, as others do a much better job of that than I. Graphics are quite nice, very clear and clean. I didn't notice as much blurring in this one as in the last couple either. Colors are bright and true. Game play was excellent, with no problems during the demo. Voices are very nice, except Dad sounded very healthy when he was suppose to be dying. The God's sounded as I would expect them to sound and not the least bit wimpy. Music wasn't bad and was not intrusive. I usually just turn it way down anyway. Sound FX were nice and fit whatever scene or area you were in at the time. Be aware, there are snakes in this one. Not a lot, but occasionally, and they do move. HOPs are a combination of interactive lists, riddles and silhouettes, so far. They are fairly clear and items are not difficult to find. I didn't not find any morphing items, but I wasn't really looking for them either. If you want something different, you can switch to a match stones game...it's the usual. Puzzles are well done and most have some level of challenge. I found a couple that took me longer than I'd expect. There is a lot of running back and forth in this one as well. Didn't seem to go to very many different areas during the demo, but I'm sure it will pick up as the game progresses. Yes, we have a jump map, but what a blank and boring map it is. The hint system is very helpful and it did transport to longer locations, which came in quite handy. Collectibles are a major disappointment. All we have are 38 Omega signs, which are quite large. They try to hide some by only showing about half of it, but they really aren't hard to spot. Definitely needed more in this department. I still like this series, and I do like this story line a lot. It is a little different...myths, you know. There was a bit more action that I figured and it seemed to have more character interaction than in the last few in this series. The game is not difficult and it is easy to follow. It seems that it was more interesting as a beta, but I did like it enough to want to play it out and see what happens. I think most levels of players will find this game worth getting. Even though the collectibles were a huge disappointment, I am going to add the CE to my collection. As always, try it for yourself and see what you think. We all have different tastes in games and you may not care for this one at all. Thanks for the reviews. Rated 4 out of 5 by Sara6777 from Somewhat Disappointing! Review based on demo, only: As anyone who reads my reviews knows, I'm a huge fan of most Eipix games...but this one left me wanting more. No morphing objects, the graphics that this dev is known for were not quite up to par, and I ended the demo feeling as though they rushed this one. Having said all that, it is still a good game... much better than most being released these days! Just not up to their standards...and those are pretty high. The HOS were pretty good, as were most of the puzzles. The collectibles were not worth the extra money...I will wait for the SE. As always, try it out for yourself. I really did enjoy the story line, btw! Rated 3 out of 5 by mxela from Average game and annoyed I have all the games in the series and have enjoyed them. This was an average game, with average skills needed. I liked this one until almost the end of the game when I was unable to get the final item in the final HOP. Hint didn't help, stones game didn't help, clicking everywhere didn't help. I couldn't finish the main game and, therefore, I can't make use of the CE I purchased and get to the bonus game. VERY ANNOYED. For that reason alone I can't recommend it. Rated 3 out of 5 by campingramps from I think this is "mything" something Usually I'm a fan of the Eipix games but this one has me on the fence. Don't know much about ancient myths but I don't think Eipix tried to follow this one closely, which they shouldn't, but used the myth as sort of a base for the game. The story progresses smoothly although there are a few back and forth moments that can be annoying but, overall, you are led through the story in a logical manner. No boredom that I could see as suggested by others. The graphics, for the most part, are crisp and colorful and the characters aren't comical. Well, except for the first one you meet on your quest. He seems a little on the doofus side. The snakes you encounter are on the creepy side and are just the right monster (?) to have where they show up. I'm not a snake fan so they put some fear in my soul. Can't comment on the music because, even if it was playing, I completely tuned it out. I could go on and on like some reviewers do and give away the plot or spoil the game for you but I won't. I'll just tell you my feelings in as short a space as I can and leave it at that. I am going to see if there is an SE version, if there is one, and probably buy that. I do recommend this game and suggest you play the demo remembering this game is not meant to follow the Myth to the letter. Have fun! Rated 3 out of 5 by smilingsun72 from Not as good as could have been... This is the first Myth of the World I can say didn't float my Myth. I thought it started out great and the story was an awesome idea but as I continued I found my interest fading fast. I soon felt as though I was just going between scenes collecting objects and solving puzzles to move on. There wasn't the inter-activeness I encountered in this series in the past. For example, the battle scene with Hades...well..I expected more. Hades just stood there and let Lysandra freeze him...no fight at all! Though there was much to do.,..it didn't have pizzazz like the other games in this series. And parts of the story lacked the richness I love about Eipix games. And I found even on the hardest setting mode the puzzles were not a challenge in other games I play on the hard mode. Now a good example of very engrossing game in this series that I liked was The Island of Forgotten Evil . Though it was about Pandora's box, Eipix took this and made an excellent story with a twist towards Ancient Rome, which I loved. Being a fan of ancient Greece I expected Fire of Olympus to be the same but it wasn't. I believe Fire of Olympus could have been an epic saga in itself instead of a mythical flop if the developers would have take the time to make it so! I recommend this game only if you want something to fill the gaps between until something Mythically Epic comes along!